Orthogonal frequency division multiplexing (OFDM) is an effective technique for high-speed digital transmission over time-dispersive channels. However, for coherent detection, a reliable channel estimation (CE) is required. 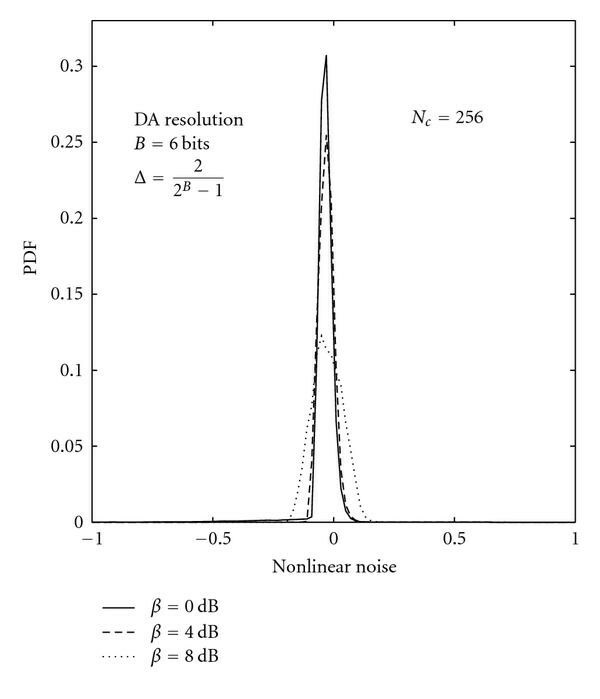 OFDM is characterized by its high peak-to-average power ratio (PAPR), which makes it very sensitive to nonlinear distortions that may affect the channel estimation accuracy leading to a bit error rate (BER) performance degradation. In this paper, we present closed-form BER expression for OFDM with a pilot-assisted CE in a nonlinear and frequency-selective fading channel. We discuss how, and to what extent, the nonlinear degradation affects the BER performance with the CE based on a time/frequency division-multiplexed (TDM/FDM) pilot. The analysis is based on a Gaussian approximation of the nonlinear noise due to both HPA amplitude limitation and quantization. We also evaluate the estimator's mean square error (MSE) with both TDM and FDM pilots. Our results show that pilot-assisted CE using FDM pilot is more sensitive to nonlinear distortions than the CE using a TDM pilot, since its pilot subcarriers are affected by nonlinear noise due to both the HPA and the quantization. In a terrestrial radio channel, the transmitted signal reaches the receiver through multiple propagation paths, which all have a different relative delay and gain. This produces inter-symbol interference (ISI) and degrades the system's performance . Orthogonal frequency division multiplexing (OFDM) can be used to overcome the channel frequency selectivity, but it requires an accurate channel estimation (CE) for coherent detection. Various CE schemes have been proposed for OFDM [2–5], where the pilot signals are multiplexed either in the time (TDM pilot) or in the frequency domain (FDM pilot). In a fading channel, the performance of an OFDM system with CE using a TDM pilot gets rapidly degraded whenever the channel has a significant time variance. On the other hand, the CE with an FDM pilot improves the tracking against a fast fading, but the performance degrades, since the noise is spread over all subcarriers due to interpolation. The main drawback of OFDM is its high peak-to-average power ratio (PAPR), which makes the system very sensitive to nonlinear distortions caused by analog components, such as a high-power amplifier (HPA) as well as digital-to-analog (DA) and analog-to-digital (AD) converters. Usually, DA and AD converters are assumed to have a large number of quantization levels and an optimally exploited dynamic range. Because of such assumptions, the quantization noise (representing the quantizer granularity) and the noise due to amplitude limitation (corresponding to the overloading distortion) can be neglected [6–8]. However, in a real implementation, in order to keep the system complexity and the power consumption low, it is desirable to keep the resolution of the DA/AD converters as low as possible [9, 10]. It was shown, in , that the quantization requirements are higher at the receiver end, particularly for severely frequency-selective channels. The analysis of the nonlinear distortions due to amplitude clipping in an OFDMA system is presented in , where it was shown that users with less allocated power are subject to stronger nonlinear interference. In , the impact of the nonlinear degradation due to amplitude clipping on an OFDM system's transmission performance was investigated with a computer simulation. To the best of the authors' knowledge, closed-form BER expressions for an OFDM system with CE in a nonlinear and frequency-selective fading channel has not been presented. In this paper, we present a theoretical analysis of an OFDM system with a pilot-assisted CE based on TDM and FDM pilots in a nonlinear and frequency-selective fading channel. We derive a closed-form BER and mean square error (MSE) expressions and discuss the sensitivity of both CE schemes to the nonlinear and channel impairments. Unlike previous papers, where nonlinear noise due to the HPA and the quantization is treated separately, we take into consideration the effects of both. Our analysis is based on a Gaussian approximation of the nonlinearity due to the HPA amplitude saturation and the insufficient resolution of the quantization. The results show that the BER performance with pilot-assisted CE based on an FDM pilot is more sensitive to the nonlinear distortion then a TDM pilot, since its pilot subcarriers are affected by nonlinear noise due to both the HPA and the quantization. The rest of the paper is organized as follows. Section 2 gives an overview of the system model. A performance analysis is given in Section 3, while the numerical results and discussions are presented in Section 4. The conclusion of the paper is set out in Section 5. The OFDM transmission system model is illustrated in Figure 1. Throughout this paper, -spaced discrete time representation is used, where represents the fast Fourier transform (FFT) sampling period. The mathematical signal representation and brief overview of pilot-assisted CE schemes are presented next. The th ( ) frame of the data-modulated symbols with is transmitted during one signaling interval. The data-modulated symbol sequence is fed to an -point inverse FFT (IFFT) to obtain the time-domain OFDM signal . where the represents the floor function (i.e., rounding to the largest integer not greater than the argument) and the quantization step size is given by , where and denote the quantizer input and output signal amplitudes, respectively. The required quantization levels per dimension can be derived as , with , where represents the variance of the additive white Gaussian noise (AWGN)  and denotes the ceiling function (i.e., rounding to the smallest integer not less than the argument). We assume that the DA converter may exceed the HPA amplitude saturation level as depicted in Figure 3. 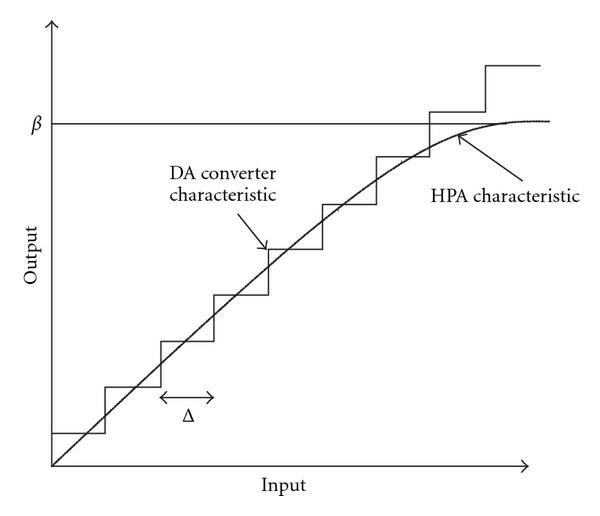 DA converter and HPA input-output characteristics. for , where denotes the HPA amplitude saturation level. We note that the relation between and the input backoff is given as , where denotes the average input power. We emphasize that we introduce the clipping effect through an HPA, for which the input-output soft-limiter characteristic is approximated by (2). Thus, in this paper we refer to amplitude clipping as the amplitude saturation of the HPA. We also note that the PAPR at the output of the HPA is affected by , irrespective of the CE scheme; a lower will give a lower PAPR and vice versa . An -sample guard interval (GI) is inserted at the beginning of each OFDM frame, and the signal is multiplied by the power coefficient , where denotes the data-modulated symbol energy. where and , respectively, denote the attenuation constant and noise due to the nonlinearity. The attenuation constant is chosen so as to minimize the MSE . It is shown in  that for the amplitude saturation level dB, . For lower , can be well approximated as , where erfc denotes the complementary error function. The nonlinear noise after quantization and HPA can be expressed as for , where and , respectively, denote the noise due to HPA amplitude saturation, and the quantization. We assume that is approximated as a zero-mean random variable with the variance . Furthermore, we assume that the quantization noise is a zero-mean random variable with the variance given by , where denotes the quantization step as illustrated in Figure 3. In this section, we first give a short overview of pilot-assisted CE with a TDM pilot, and then pilot-assisted CE with a FDM pilot is presented. 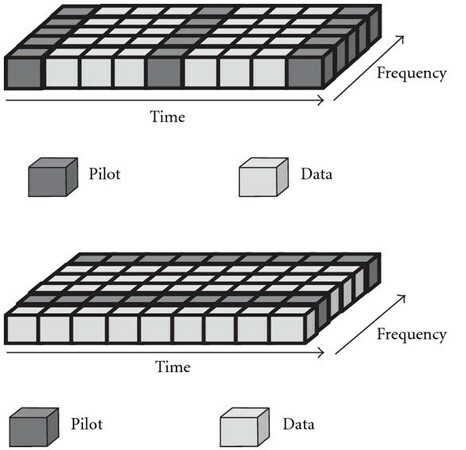 In pilot-assisted CE with a TDM-pilot, the transmission block consists of a number of an -sample size frames (i.e., the pilot signal is transmitted in the first ( ) frame followed by data frames) are illustrated in Figure 4(a). for , where and , respectively, denote the distorted part of the channel gain estimates at the 0th frame due to the quantization and AWGN at the th subcarrier. Block diagram for CE with TDM pilot. In pilot-assisted CE using the FDM pilot the frequency-domain interpolation is used over equally-spaced pilot subcarriers as a subset of subcarriers. In , it was shown that the optimum FDM-pilot scheme is the one with equally spaced inserted pilots. We also note here that the amplitude saturation level has no effect on the optimal distribution of the pilot subcarriers, since the nonlinear noise is a random variable that is equally distributed over all the subcarriers in the frequency domain by the receiver's FFT. for . In (9), and , respectively, denote the th frame's distorted part of the channel gain estimates due to the HPA saturation and quantization at the th subcarrier. In this section, first the closed-form BER expressions for pilot-assisted CE with both TDM and FDM pilots in a nonlinear and frequency-selective fading channel are presented, and then the estimator's MSE under the same conditions is evaluated. 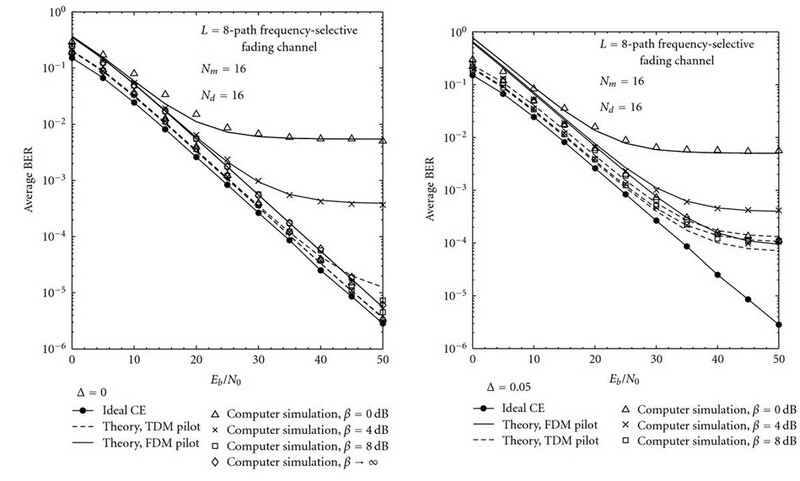 To date, there have been a lot of papers based on computer simulation for both TDM and FDM pilots, but the theoretical analysis in a nonlinear and frequency-selective channel has not been presented. 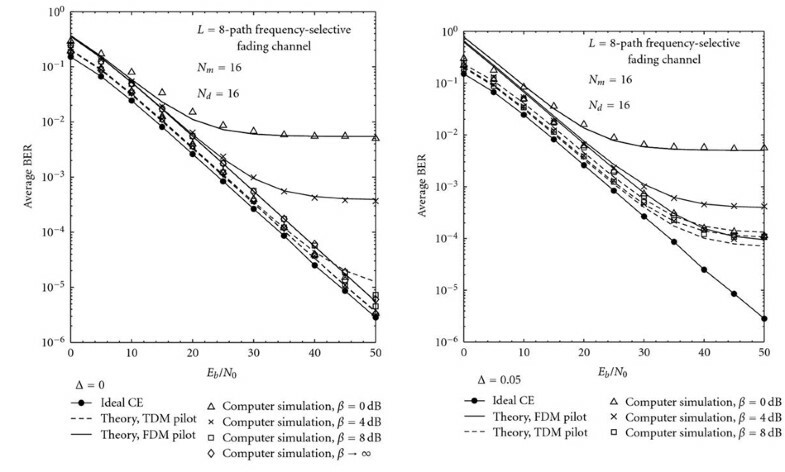 The probability density functions (PDFs) of the channel estimation error for both TDM and FDM pilot CE are evaluated with computer simulation in Figure 6. 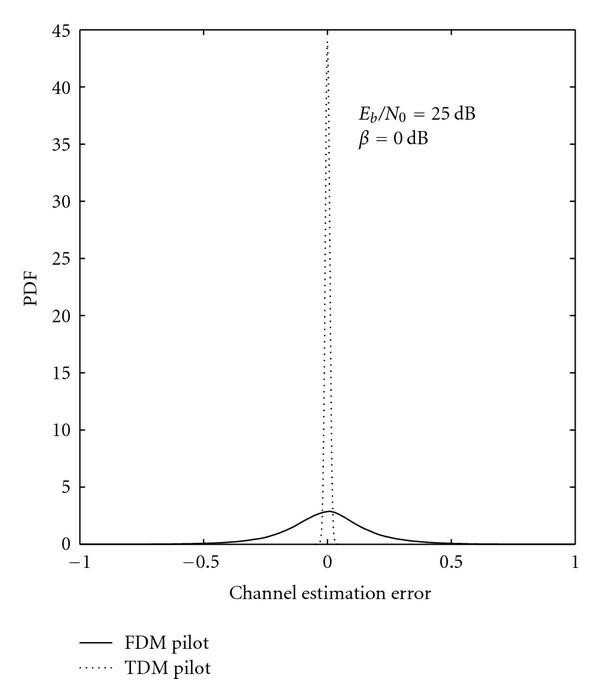 It is evident from Figure 6 that the standard deviation is higher for the FDM pilot, since the channel estimation error values are spread over a wider range. Since Chu sequence is used as TDM pilot with a constant (practicaly a very low) amplitudes in both the time and frequency domains, the channel estimator is only affected by pilot quantization giving the sharper shape on CE error's PDF in Figure 6. On the contrary, the shape of CE error's PDF for the FDM pilot is more spread, since the pilot subcarriers are affected by nonlinear noise due to both the HPA and the quantization. Naturally, this will have a negative effect on the FDM pilot performance in comparison with TDM pilot. This will be more discussed in details in Section 4.2. PDF of the estimator's error. We note here that in this analysis, only uniform quantization is considered, since in the case of nonuniform quantization, the quantization errors may not be approximated as Gaussian random variables, and the analysis may become very difficult if not impossible. Our analysis is based on the Gaussian approximation of the nonlinear noise, and the suitability of this approximation is confirmed by computer simulation as shown in Figure 7. PDF of the nonlinear noise. where denotes the normalized covariance given by . Here, , and denote the second moments of the random variables , , and , respectively. Next, we derive the closed-form BER expression in a nonlinear and frequency-selective fading channel with both TDM and FDM pilots. Finally, the average BER is obtained by (11). where and are defined in Section 3.1.1. Finally, the average BER is obtained by (11). We note that in the case of CE with the FDM pilot . where and are defined in (15). Finally, the average BER is obtained by (11). We define the MSE of the th frame at the th subcarrier as and assume that the HPA amplitude saturation level is known at the receiver. where . The first term in (23) denotes the negative effect of the nonlinearity due to the quantization, while the second term denotes the influence of AWGN. where the first, the second, and the last term denote the negative effect of the nonlinearity due to the HPA amplitude saturation, quantization, and AWGN, respectively. The OFDM-based system assumptions used in the computer simulation are given in Table 1. We assume an OFDM signal with subcarriers, , , and QPSK data modulation. As the propagation channel, we assume an -path block Rayleigh fading channel with a uniform power-delay profile; are independent and identically distributed zero-mean complex Gaussian variables having the variance . It is assumed that the time delay of the th path is samples (i.e., the maximum delay difference is less than the GI length, since ). We have chosen for the normalized Doppler frequency (where ), which corresponds to a terminal speed of 40 km/h for a 2 GHz carrier frequency and a transmission data rate of Msymbols/sec. We assume that the data rate is kept the same for both the TDM and FDM pilot schemes since an equal number of pilot subcarriers is transmitted within the transmission block (i.e., in total pilots are transmitted over frames) irrespective of CE scheme. In the case of CE with the TDM pilot, we use a Chu-sequence as a pilot given by ; . We emphasize here that the case of and represents a linear HPA and an ideal quantizer. First, we evaluate the BER performance with pilot-assisted CE using both TDM and FDM pilots in a nonlinear and frequency-selective fading channel. The analytical and simulation results in terms of the average BER performance as a function of the with amplitude saturation level as a parameter are illustrated in Figure 8(a) for , that is, without considering the quantization noise. When we include the quantization noise ( ), the BER performance is further degraded, as shown in Figure 8(b). However, the BER performance with CE using the FDM pilot becomes significantly worse. This is because with CE using a FDM pilot, the pilot subcarriers in addition to degradation due to quantization are affected by the HPA as well. Moreover, the frequency-domain interpolation will cause spreading of the nonlinear noise over all the subcarriers leading to a larger BER performance degradation in comparison with CE using the TDM pilot. However, the BER performance with pilot-assisted CE using the TDM pilot is degraded as well, since the nonlinear noise due to the quantization cannot be neglected. It is evident that fairly good agreement between the theoretical and simulated results is achieved, which confirms the validity of our theoretical analysis presented in this paper. Next, we investigated the effect of nonlinearity on the channel estimator with both the TDM and FDM pilots by numerically evaluating its MSE. For the CE with the TDM pilot, we select , while for the CE with the FDM pilot, and consequently, the same transmission data rate is maintained. The MSE of the channel estimator is shown in Figure 9. First, we show the impact of the quantization step in Figure 9(a). It is evident from the figure that the HPA amplitude saturation level does not affect the MSE of the channel estimator for the CE using the TDM pilot. This is because the performance is not affected by the HPA amplitude saturation for the CE using the TDM pilot, since we are using the Chu pilot sequence which has a constant amplitude in both the time and frequency domains. The impact of the HPA amplitude saturation level is presented in Figure 9(b) for value dB in order to better observe the effect of parameter . It is evident that the quantization noise represented through quantization step affects more the MSE of the channel estimator for the FDM-based pilot-assisted CE. Finally, in Figure 9(c), the impact of is plotted. In comparison with pilot-assisted CE with the TDM pilot, the MSE of the channel estimator with the pilot-assisted CE based on the FDM pilot is more affected by nonlinear noise. This is because for the CE with the TDM pilot the Chu pilot sequence is used with a constant (practically a very low) amplitudes in both the time and frequency domains, and consequently, the channel estimator's performance using the TDM pilot is not affected by the HPA. The nonlinear degradations in this case are only due to the quantization. This is because of the fact that for pilot-assisted CE using the FDM pilot, the pilot signals are inserted onto dedicated (i.e., pilot) subcarriers in frequency domain within the OFDM signal. Consequently, the corresponding OFDM signal in the time domain may have a large PAPR causing a signal degradation due to nonlinear noise coming from both the HPA and quantization. After the FFT at the receiver, the nonlinear noise will spread over all the subcarriers and affect the pilot subcarriers. Naturally, this will have a negative effect on the channel estimator's performance in comparison with the pilot-assisted CE using the TDM pilot. In this paper, we have presented closed-form BER expressions for OFDM with CE based on both TDM and FDM pilots in a nonlinear and frequency-selective fading channel. In our analysis the nonlinear noise is approximated with a Gaussian random variable, where unlike previous studies, we consider the impact of both the DA converter and the HPA. The results show that the pilot-assisted CE with the FDM pilot is affected by the nonlinear noise due to both the quantization and the HPA, while the pilot-assisted CE with the TDM pilot is only affected by nonlinear degradation due to quantization because of the pilot-sequence with low PAPR. Thus, the higher BER with FDM pilot in comparison with TDM pilot is observed. Furthermore, numerical results have confirmed the validity of the analytical derivations in terms of closed-form BER expressions, since a fairly good agreement between the simulation and the analytical results is observed. This work was supported in part by Ministry of Civil Affairs of Bosnia and Herzegovina with support grant for preparation of EU FP7-related research projects.